As a hospice medical director I’ve been to a lot of funerals, but only one of them has been labeled “perfect” in my memory. Over the years I have made it a practice to attend the memorial services for as many patients as my schedule will allow, usually to show my respects for the deceased and to offer support to the family, but sometimes to comfort my own grief. Some patients manage to work their way into my heart so deeply that I miss them desperately when they are gone. The funeral is a place where I can grieve side-by-side with others who also loved the departed person for their own special reasons. Ralph was one of those unforgettable patients who left me with an aching heart when he died. He was actually a homeless man—or “hobo” as we used to call them—who camped out by the railroad tracks and had ridden the rails most of his adult life. When he was stricken with kidney cancer he was admitted to our hospice for terminal care, which we provided to him in a seedy basement apartment a social worker had found for him several months before. We expected to be taking care of Ralph for about two weeks—his kidneys were failing and he was not a candidate for dialysis. But Ralph surprised us all by living for an entire year, which was nothing less than a miracle in our eyes. During that wondrous year Ralph discovered he had a talent for drawing and produced extraordinary sketches of places he had seen on his railroad travels across the country. Each time we visited him he would show us his latest drawings—at first in a spiral notebook with lined pages; then on a sketchpad given to him by a staff member. Ralph was an amazingly talented artist who didn’t realize his own abilities until the last moments of his life. But then, through an awe-inspiring act of grace, his death was postponed long enough for him to create a portfolio of work before he left this world. He was also a kind, humble and generous man who stole the hearts of everyone who came to know to him, creating a “portfolio” of relationships, as well, during his last days. When he died, Ralph’s body was taken to the county morgue and eventually cremated after no next-of-kin could be located. We learned that his ashes were to be spread in a “pauper’s grave” with no service or ceremony to mark his passing from this world. In a hasty staff meeting we decided to claim Ralph as part of our own “hospice family” and retrieve his ashes so that he could have a proper burial. The following week, on a beautiful sun-splashed day, we took the cardboard box of Ralph’s ashes to a riverside park just outside our city where he used to love to go fishing. As an afterthought I had stopped by his apartment building earlier that morning to mention our little memorial service to his neighbor Greg, in case he wanted to join us. When we arrived at the park we were surprised to see a group of 13 people already gathered at a spot beneath a beautiful old cottonwood tree. Greg was there and several staff members, but I didn’t recognize anyone else in the group. We later learned that they were all residents in Ralph’s apartment building who had gotten to know him over the past year, just as we had done. Silently Greg and one of the other men dug a small hole beneath the elegant old tree. Then we opened the box and gently sprinkled Ralph’s ashes into the gaping cavity where he was welcomed back to the Earth and its elements. One by one, each person in the circle sprinkled dirt over the ashes and told a story or offered a brief remembrance of Ralph. We were touched to hear his neighbors all call him “Pops” and to recognize that he had played a grandfatherly role to the other struggling inhabitants of that decaying old apartment building. 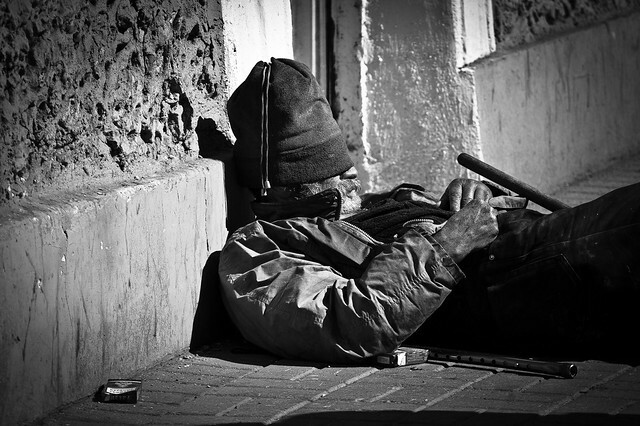 There was no music, no sermon, no liturgy that day—just an unplanned outpouring from an unlikely ragtag collection of people whose lives had all been touched by a homeless man with a huge heart. The tears and the love flowed freely for this simple person who had lived such an inconspicuous life and there could not have been a more appropriate ceremony to mark his death. Keep it simple to allow for spontaneity and surprise. Make it authentic by avoiding canned sermons from strangers—encourage loved ones to speak from their hearts. Reflect the life of the person being remembered by planning the kind of event he or she would have been delighted to attend. Share the joy of a life well-lived with both laughter and tears. Ralph had been given more that his share of difficulties in his lifetime, but had managed to create a unique work of art from the broken pieces of his existence. And his simple little funeral had been a perfect reflection of his free-spirited ride through this world: heartfelt, authentic, and spontaneous. To be so loved and so remembered at the end of one’s days is truly a blessing—may we each be so fortunate when the time comes for our own farewell. Dr. Karen Wyatt is a hospice and family physician who writes extensively on spirituality and medicine, especially at the end-of-life. 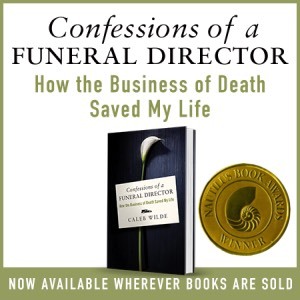 She is the author of the award-winning book “What Really Matters: 7 Lessons for Living from the Stories of the Dying.” She hosts the popular online interview series End-of-Life University. Connect with her at karenwyattmd.com. This entry was posted by Caleb Wilde on July 28, 2015 at 7:57 pm, and is filed under Aggregate Death. Follow any responses to this post through RSS 2.0.You can leave a response or trackback from your own site.